Save time and money by removing gold tones from your hair at home. Whether you have recently bleached your hair or your previously lightened hair color is a bit washed out, you might experience some brassy-looking gold tones. If you prefer a deeper and more uniform color, it's best to remove the brassy gold effects. You don't have to be a professional hairdresser to even out your hair color. Everything you need to get the gold out of lightened hair is available at your local beauty supply retailer. Try a brightening shampoo and conditioner. Many department stores and beauty supply retailers sell shampoos and conditioners specially with formulated with blue-based temporary dyes to counteract gold and orange "brassy" hair tones. Shampoo and condition your hair with brightening products for a week or so. If desired results are not achieved after a few treatments, proceed to adding a color toner. Pour a blue-based toner into a small mixing bowl. Choose a blue-based color toner, such ash light, medium or dark ash blond, to offset the brassy tones. Add a level-10 developer cream to the toner. The amount of toner and developer may vary according to product brand. Follow manufacturer directions when measuring such chemical solutions. Put on a pair of latex gloves and use a color application brush to thoroughly mix the toner and level-10 cream developer. Frequently scrape the sides of the bowl with your brush to ensure even blending. Continue mixing and scraping until a thick solution uniform in color is established. Prepare for color application by wrapping a towel around your neck and slipping a plastic cape around the towel. Part your hair down the middle from front to back and again from ear to ear, making four even sections. Use a large hair clip to secure each section. Remove the clip from one of the back sections. Use the brush to generously apply the color solution from the roots to the ends until the entire section is saturated. Un-clip the other back section and repeat the same procedure. Continue to the front two sections until all of your hair is evenly covered with the solution. 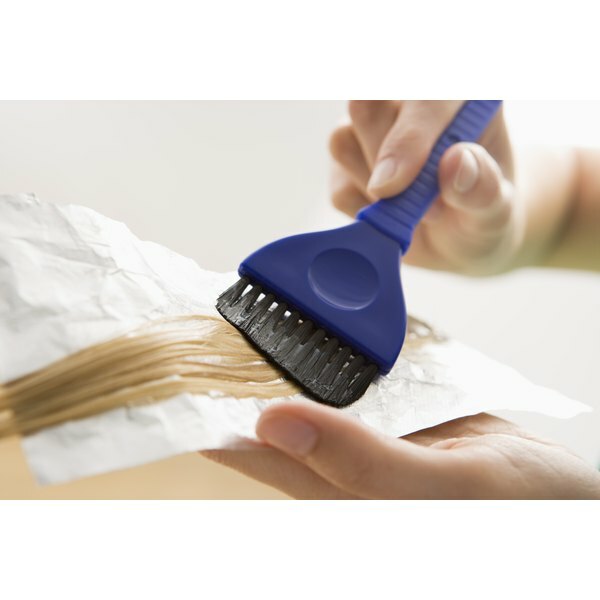 Ensure that your entire head of hair is thoroughly covered and allow the color solution to set in for about 10 minutes. Separate a small strand of hair and rub it dry with a towel to gauge your results. If your color is still brassy, wait another 10 minutes. Do not exceed 20 minutes of total color treatment time. Adjust your water faucet to the highest temperature you can bear. Rinse your hair thoroughly with warm water, starting at the roots and working the solution down through the ends with your sprayer. Continue rinsing until all traces of color solution are gone and the water runs clear from your hair. Squeeze as much excess water from the hair as possible. Apply a small amount of conditioner to the hair and work it evenly through. For drier textured hair, apply a little extra conditioner to the ends. Rinse thoroughly and style your hair as you wish. Quickly wipe away any solution that drips or smears onto your skin with a warm, wet washcloth or paper towel to avoid staining.